We present our Links Of Chain PowerPoint Templates And PowerPoint Themes 1112.Use our Success PowerPoint Templates because, Set out the goals and your plan of action for them. Use our Security PowerPoint Templates because, Leadership Template:- Show them the way, be Captain of the ship and lead them to new shores. Use our chains PowerPoint Templates because, Draw on its universal impact to highlight the similarities with your organizational structure and plans. Use our Industrial PowerPoint Templates because, Use our template to illustrate what you say. Use our Business PowerPoint Templates because, Transmit your passion via our creative templates.Use these PowerPoint slides for presentations relating to "Strong link concept, security, success, chains, business, industrial". The prominent colors used in the PowerPoint template are Red, Black, White Eliminate contradictions with our Links Of Chain PowerPoint Templates And PowerPoint Themes 1112. Dilemmas will begin to disappear. 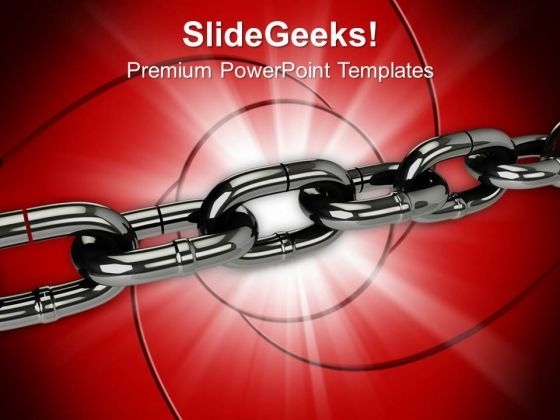 Change behavior with our Links Of Chain PowerPoint Templates And PowerPoint Themes 1112. Just download, type and present.